Front Sight in Nevada - a whole town for shooters. At the first view there's not much difference to be seen between Front Sight Firearms Training Institute and other establishments of this sort. Today it is just a fenced stretch of land with a dozen shooting ranges. Close to the entrance gate you'll find a huge hut, which contains temporary lecture hall. Few big containers strewn among sand hills provide room for offices, gun shop and instructors' quarters. In another words nothing overly impressive. But this first impression doesn't tell the whole story. One look at the landscape model on display in the lecture hall explains why. Behind currently existing installation you can see a construction site where 250 hectares of desert real estate is converted into exclusive resort for shooting enthusiasts. In four years - if all goes well - this patch of desert will be a small community with 177 homes and 350 condos. It is planned that those who wish may live here permanently. Inhabitants will have their own supermarket, restaurant, school and private landing strip. Roads and lawns will be laid down and trees planted. It will be even possible to take a bath in the artificial pond. On the model, this part reminds of a suburb of any large America city. With this difference of course, that all community members share the same interest - shooting. The current installation is only the first stage of the whole project. Number of shooting ranges will increase to 22 and some of them will be exclusively reserved for community members in order to avoid clashes with guests from outside who participate in courses. Area is so huge and so remote that some shooting exercises may be conducted in the surrounding terrain. New lecture hall is planed for the theoretical part of training. Current provisional gun shop will develop to full-fledged Pro-Shop combined with armory. Plans include also underground tunnels, martial art gym etc for advanced training of professionals. Dr. Ignatius Piazza is the man behind Front Sight. He is the founder, owner and CEO in one person. Piazza is a relative new comer in this business and in difference to other American "gun gurus" does not have military or law enforcement background. His career in firearms training started by coincidence. Dr Piazza is a former chiropractor from California. He was once involuntary witness to drive-by shooting in his neighborhood. This tragic event prompted him to seek some sort of training in armed self-defense. After few courses he still considered himself a beginner. He continued his training through several years and finally became the Combat Master in four weapons systems - pistol, shotgun, rifle and sub-machine gun. During this period he had visited most prominent shooting schools (with which he's competing today). Among those were Jeff Cooper's Gunsite, Mass Ayoob's Lethal Force Institute and Clint Smith's Thunder Ranch. There are about 80 million gun owners in USA today without any formal firearms training. It was obvious for Piazza that those currently existing schools won't be enough and there is still room on the market for enterprises like Front Sight. He began his activities in 1996 by organizing courses on shooting range near Bakersfield, California. Piazzas ambition wasn't just limited to start yet another shooting school. After few years he moved Front Sight to neighboring Nevada because the real estate prices there were lower. Besides, authorities in this state have more tolerant attitude to the idea of private gun ownership. These two factors were decisive for localization. Purchase of the land in Nevada created conditions for realization of Piazza's long time dream - to build a world class resort, which for the shooters would have the same significance as exclusive Pebble Beach has for the golfers. Front Sight will cost about 40 million dollars when completed. Piazza is very proud of the fact that so far all is paid for with the cash flow generated by operation and sale of memberships. About 20000 shooters participated in all kinds of firearms training courses during recent four years. According to Piazza, neither courses nor membership in Front Sight is anything for "gun nuts". His clientele consists of relatively well off gun owners, respectable people who will meet like minded in the relaxed atmosphere of an exclusive resort. There they may pursue their hobby without any disturbances from outside. Membership program in Front Sight is called "First Family Membership" and is sold in four values - copper, bronze, silver and platinum. The least expensive - copper membership - costs about $11000 and includes among other things free participation in selected courses as many times as one may wish. Platinum membership cost about half million dollars. It entitles to a plot for own home in the community and unlimited access to all shooting ranges and all classes held at Front Sight So far about 50 of platinum membership have been sold. Memberships in other values must sell well too. Quite a few of co-participants at my course were First Family Members. Piazza is quite aware that most of media in USA is negatively disposed to private gun ownership. People with interest in firearms are quite often portrayed as primitive rednecks or extremists clad in camouflage. Neither is Piazza much impressed by lobbyist organization National Rifle Association. Instead, he invites journalists under condition that they participate in one of the courses. In this way they get a chance to meet other shooters and find out that this stereotype picture spread by media is completely false. What they see instead is that all kinds of respectable people - businessmen, doctors, policemen and housewives - train under supervision of knowledgeable and courteous instructors. No less important is the message that training stresses safe gun handling practices and propagates for responsible gun ownership. Piazza claims that none of students ever misused skills achieved at Front Sight. Piazza is of course a businessman, interested in commercial success of his enterprise but at the same time he sees himself as a spokesman for whole shooting community. That's why his PR efforts are not limited to media only. Red carpet rolls out for celebrities - movie stars, politicians and CEOs of big corporations. He maintains that the best way to turn current negative development is through persuading the elite of the nation that the gun ownership and shooting have fully justified place in the society. 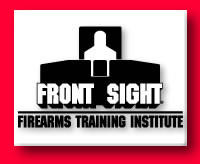 Front Sight facility in Nevada is currently developed to such extent that it enables conducting courses in defense pistol and shotgun as well as precision rifle. This year activities will be extended to hunting rifle courses and classes tailored especially for professionals. You can choose between two-days or four-days training programs. Shorter training cost about $500 and those longer twice that much - prices will though increase this year. Participants have to buy their own ammo. Beside basic training in each weapon system, Front Sight organizes all kinds of repetition and skill building courser. Instructors are recruited mainly from military and low enforcement personal with long experience in firearms training. Some of those I met had very impressive background and as members of elite units participated in real life operations. In-house training is today so advanced that Front Sight can self "grow" its own instructors. This writer is a pistol shooter and firearms expert. He is also chief feature writer for Handvapen-Guiden magazine.